Tonight we board a plane bound for Spain. We’re bidding farewell to the United States for six months or more, depending on where the road takes us next. We never intended to start our full-time travels in our home country, roaming from coast to coast in an RV, but we’re glad it worked out the way it did. For the past four years we’ve constantly been awed and amazed by the scenic beauty this country has to offer, from Colorado’s giant sand dunes backed by snow-capped mountain peaks to the red-hued spires of Bryce National Canyon, from intriguing, colorful cities like New Orleans to the vibrant palettes of Yellowstone. This slide show captures only a small fraction of what we saw and experienced during an unforgettable first installment of our travel adventures. Goodbye, for now, America. We’ll truly miss you. Bon voyage. Have a safe flight and a great trip. 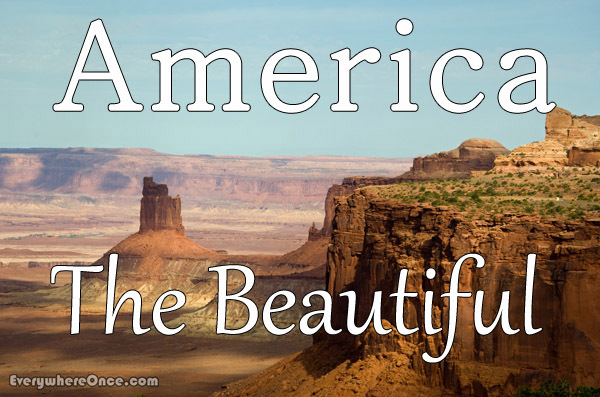 Great collection of some of America’s breathtaking landscapes. Safe travels! A beautiful country indeed. Have a great time in Europe. Let me know if you are coming to my little bit of northern Tuscany. Tuscany is definitely a place we’ll get back to, but it probably won’t be this year. Weather, visa restrictions, and our preferred slow pace of travel may prevent us from getting to Italy until at least next spring. But get there we will! Safe travels. Will look forward to reading about your adventures overseas. Thanks for sharing all your beautiful photos of the past four years. You’re welcome and thanks for reading. In London there is at least one expat who’s a devoted fan of your reports and looking forward to your European adventures. Bring ’em on. We’re glad to have you along for the ride, Digger! Have fun!!!! We started in the USA too. Great prep!!! Beautiful images! Can’t wait to see your images of Spain. Oh my! You are getting really good at this. Bon voyage. We are currently in Spain, and this is not our first visit, and I am sure you will love the country, the people are friendly and helpful. The history is evident everywhere, and the countryside beautiful. I look forward to reading your blog posts even more! Gorgeous tribute shots. Safe travels! Spain is great! Try to see and walk a little of one of the pilgrimage routes into Santiago if you have time. It’s a wonderful experience. Happy journeying. Absolutely amazing photo “song”! Those are incredible images and makes me really appreciate home. 🙂 That being said, have a great time in Spain! What a beautiful photographic tribute to the U.S.! Have fun on your new adventures! Beautiful images. Thankyou for taking us on your journey to date. Hope you complete the Google map of your travel to date. Would love to see a visualization of how much of your great country you covered over the four years. All the best for Europe, bet you are excited! Hey guys. We have been delinquent in updating that map. It’s something we really need to get back to. Thanks for the gentle reminder. We’ll let you know when it’s done. Awe inspiring pictures. Enjoy Spain.